A few years ago, I seemed to be spending half my time on planes as I managed a series of projects across Europe. Anyone who flies regularly on business will know what a pain in the backside it can be, but I took solace from the fact that I could ogle watches in places like Geneva and Munich (airports, I mean) and occasionally play spot-the-watch on the flights themselves. Anyway, on the second leg of a flight to Ljubljana – that’s in Slovenia, by the way – one day a pretty smart businessman sat next to me and proceeded to read the paper. I couldn’t help but notice his watch, which was a steel and rose gold Datejust Turn-O-Graph with white dial and jubilee bracelet and, from that moment, I’ve been keeping my eyes peeled for one. I think they’re beautiful. The Turn-O-Graph/Thunderbird was first introduced in 1953 and gained its moniker for being the watch provided to the Thunderbird aeronautics squadron of the US Air Force. 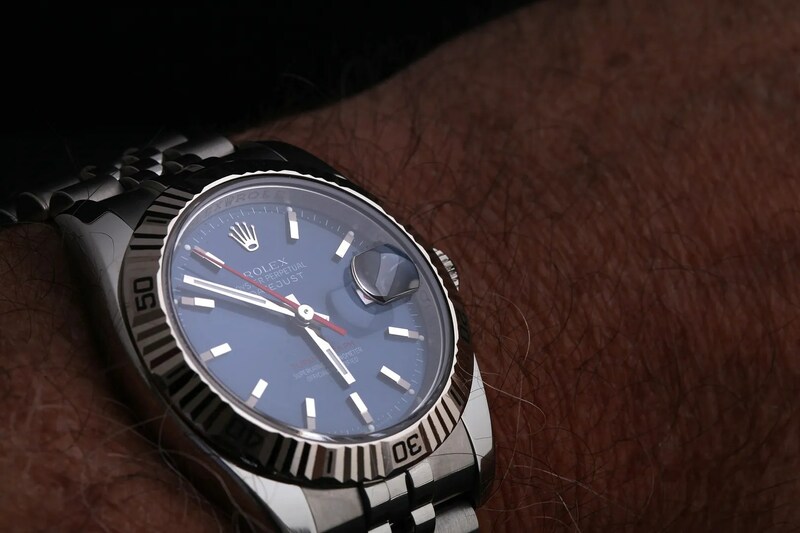 It’s always received a mixed response as, with its rotating fluted bezel, it’s not quite a dress watch and not quite a sports watch (which is actually precisely what I like about it). 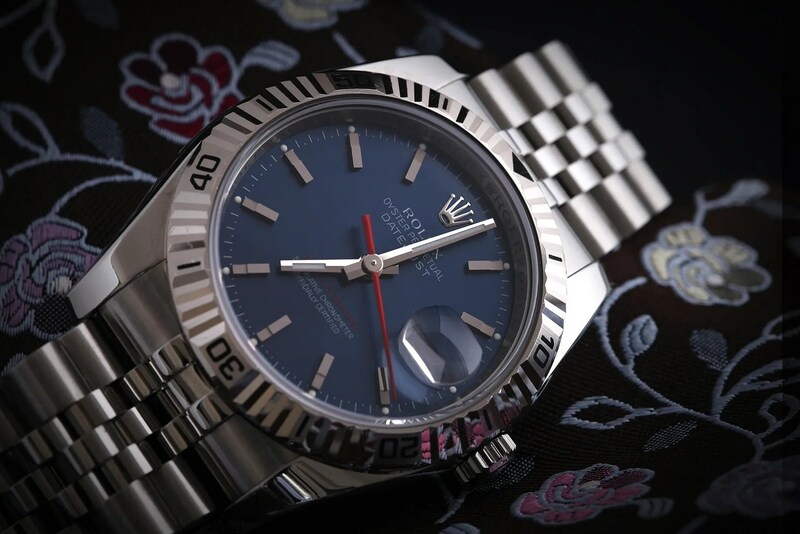 That said, there was a host of iterations prior to the current datejust version and some of the vintage models are highly sought-after. Personally, I’ve never liked the older references but that’s not to say that I can’t appreciate them for what they were/are. 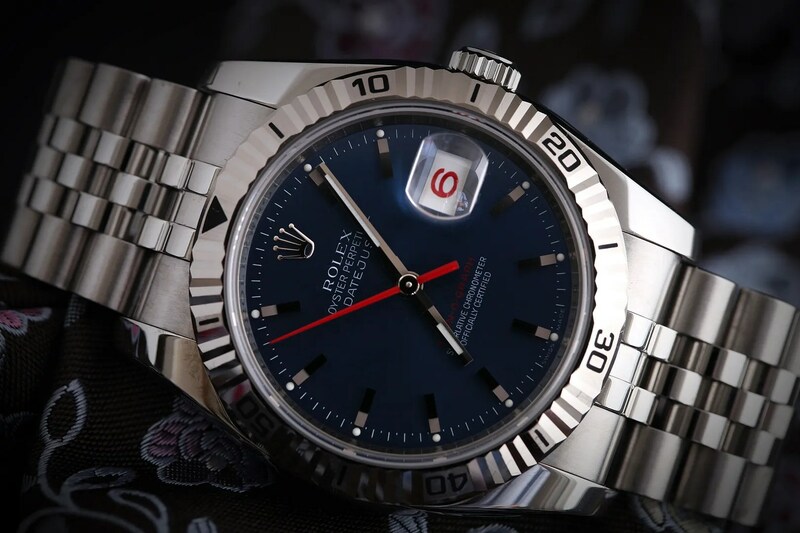 So, not long ago I received a heads-up from a member on TZ regarding a Rolex (and other) dealership in Malaga that was having a bit of a clear-out. Fast forward to today, and I received the first watch I’ve bought new from an AD for some time, and the watch I’ve been hankering for since that flight I mentioned earlier. 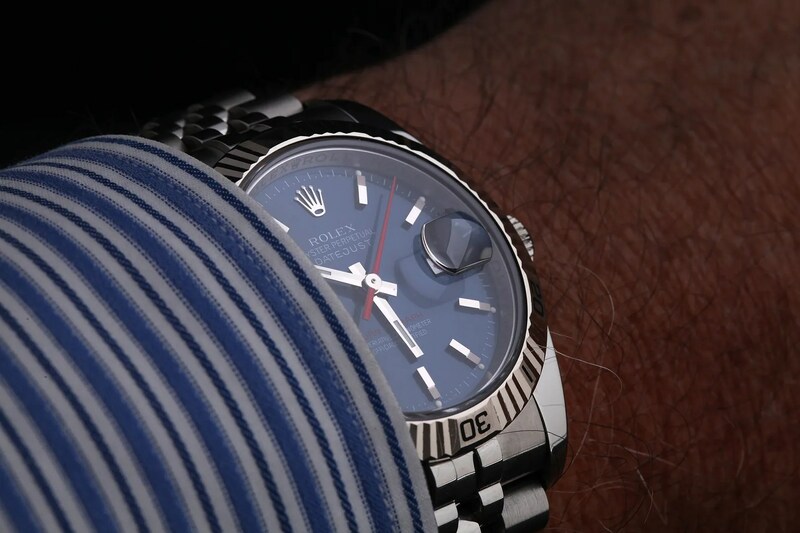 It’s a reference 116264, in stainless steel and white gold. 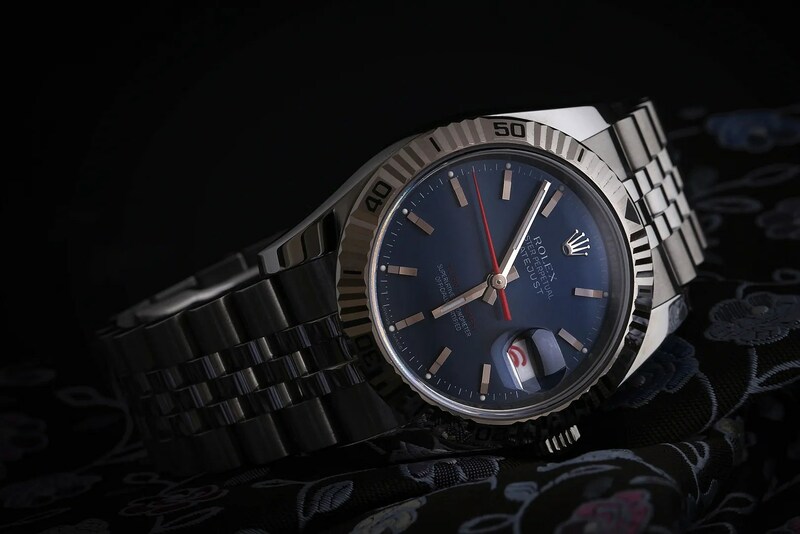 the dial is the blue that Rolex does so well, and there’s more than a hint of red (in the second hand, the model name and the date wheel) that gives it an extra touch of vibrancy. 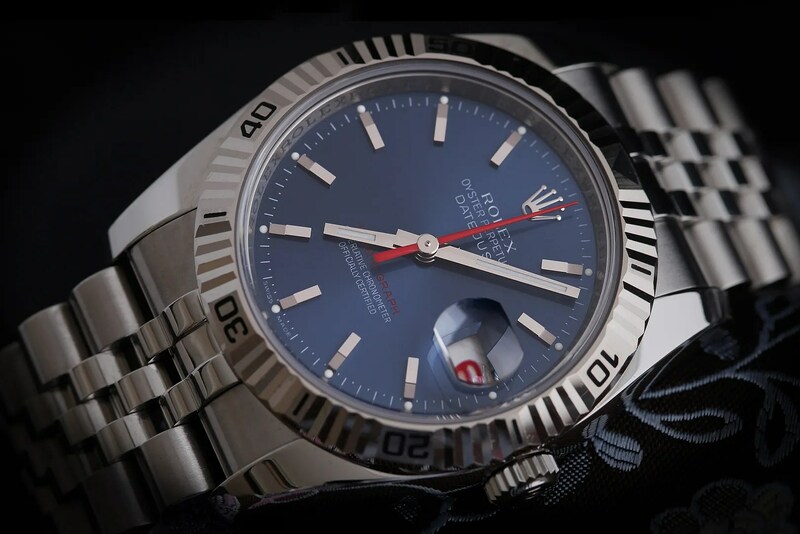 I love the blue with red accents, and the dial changes quite dramatically depending on the way that the light hits it. The photos below show that quite well, I think. I’m very pleased with it!